1. Talia Shire does not appear in the cast for Rocky Balboa. Why not? Details about her illness are left to the description "woman cancer"
2. In previous movies Rocky's owned a Firebird, a Maserati, a motorcycle, and a Lamborghini. What's he driving now? 3. Rocky runs an eatery where he likes to recount old boxing memories. What's the place called? The sign reads "since 1996"
4. Which character from Rocky's past is a regular at Adrian's Restaurant and eats for free? A former opponent, Spider is often seen reading his Bible and is in Rocky's corner late in the movie. 5. On the anniversary of Adrian's death, Rocky takes a tour of places that were special in their lives. Which one is not part of the tour? 6. Paulie still works at the meat plant but he has an interesting pastime. What is it? Some of his art is displayed in Adrian's Restaurant. 7. Rocky reconnects with the Little Marie, who he walked home when she was a kid. Now she has a kid. What's his name? Marie appeared in the first Rocky movie, played by Jodi Letizia. In Rocky Balboa she's played by Geraldine Hughes. 8. Rocky does a number of unsolicited favors for Marie. Which one is she most resistant to? She eventually takes it when it's clear he's not asking for anything in return. 9. Rocky and Marie's son become pals and they pick out a dog for Rocky. What is the dog's name? In the original simulation, Marciano won it all without fighting Ali, so Ali and Marciano filmed a rematch. 11. Who does Rocky fight in ESPN's simulation? 12. Which real life fighter portrays Mason Dixon? Tarver won an Olympic Bronze medal in 1996 was a light heavyweight champion as a professional. 13. Who is the most-enthusiastic, and least enthusiastic, for a fight between the current champion and the former champion? 14. Why does Rocky apply for a boxing license? 15. What is the boxing commission's decision at the hearing for Rocky's application for a boxing license? Rocky delivers a great speech which changes their minds and they later approve the license. 16. What is Duke's training strategy to give Rocky a chance to beat Mason Dixon? "You gotta be willing to take the hits, and not point fingers saying you ain't where you wanna be because of him, or her, or anybody! Cowards do that and that ain't you!" 18. Mason Dixon weighs 221. What is Rocky's weight? He's 15 pounds heavier than his lightest weight in the previous films. 19. What are Rocky's colors for the fight? 20. Rocky's entrance music was picked by Paulie. Name that tune. 21. Mason Dixon talks to a real life celeb in the seats. Who's there to watch the fight? The two trash talk each other, with Tyson referring to "that midget" in Dixon's crew. 22. 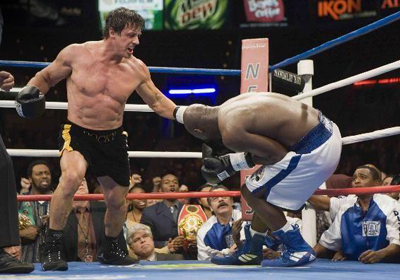 Before his first match with Apollo Creed, Rocky had won 44 fights. How many career wins has he had before fighting Mason Dixon? Rocky's stats are announced as 54 wins, 23 losses, and 1 draw. 23. What injury is sustained during the fight? 24. How many rounds does the fight last? 25. What is the outcome of the Balboa-Dixon fight? As with the first Rocky movie, he's still a winner and people's champion even though he loses the match.